How to import your expense data to DATEV. Circula allows accountants to export expense data and expense receipts to DATEV for your further accounting process. DATEV Unternehmen Online incl. Belege Online is activated. The editing function "Erweitert" in "Belege Online" is activated. 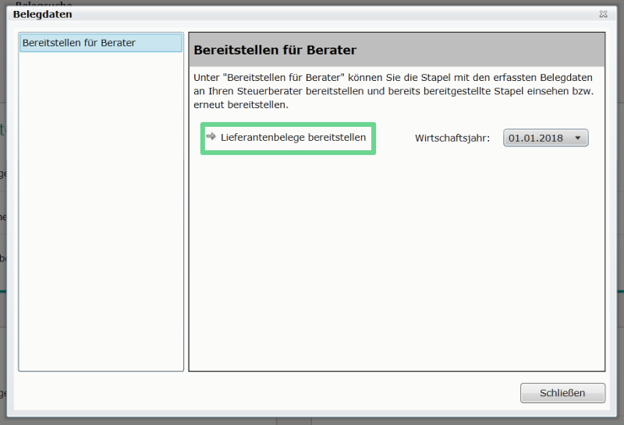 To apply this setting, go to 'Settings' in the right sidebar of Belege online and and open "Bearbeitungsform". You will find the option "Erweitert" for the editing form of supplier and customer invoices. Select this option to apply the suggested default settings. DATEV Belegtransfer module is installed. More information on the module can be found here. In the 'Ready for Export' tab, select the desired expenses and click 'Export'. Continue by selecting the 'DATEV Export' option in the sidebar and click again on 'Export'. The file is now in your local Downloads folder. Amount in EUR. For compatibility reasons, amounts with foreign currencies are exported in EUR. ❕Important: Please make sure that the Employee IDs and Categories created in Circula match their respective accounts in DATEV (Employee ID - Gegenkonto; Category Booking Code - Sachkonto). Open the program Belegtransfer. To set up the import of receipts, please click ‘Verzeichnisse hinzufügen’. Fill out the Berater and Mandanten ID. Please make sure all the checkboxes are ticked. 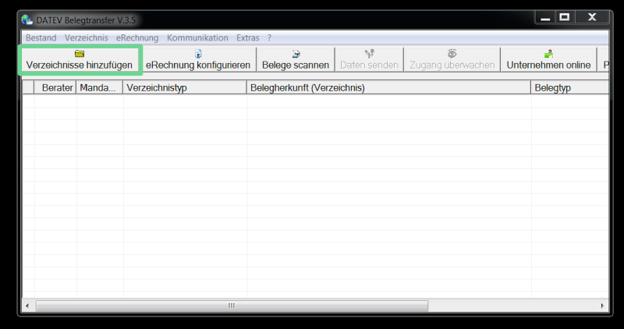 Next, please choose a folder in the field Basisverzeichnis for the storage of all future Circula DATEV exports. 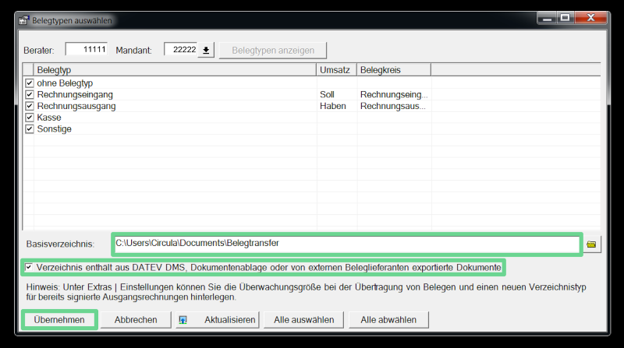 Tick the checkbox ‘Verzeichnis enthält aus DATEV DMS, Dokumentenablage oder von externen Beleglieferanten exportierte Dokumente’. Save your setup by clicking ‘Übernehmen’ the bottom of the window. 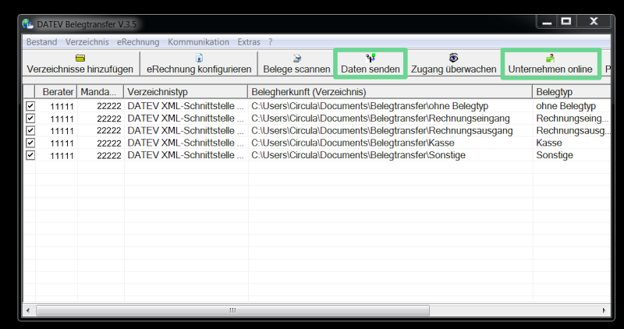 Please copy the downloaded DATEV Export file to the subfolder ‘Ohne Belegtyp’, which was automatically created in the folder you chose in the field Basisverzeichnis in the previous step. Next, open Belegtransfer again and click ‘Daten senden’. If the transfer was successful, you’ll receive a notification which you can confirm by clicking ‘Ok’. 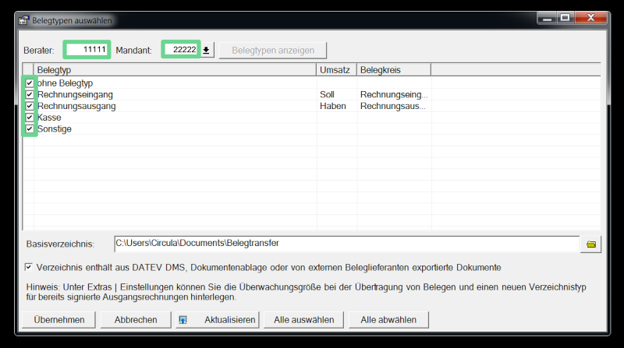 You can now find all the receipts from the DATEV Export in DATEV Unternehmen Online. ❕Important: Please do not edit the downloaded DATEV Export file, otherwise the format might not be recognized by DATEV. In the mask that appears you can select an upload period. Once selected, a listing of all uploads for that period is displayed. In the column Status you can see the current status of the upload. Select ‘Belege’ in DATEV Unternehmen Online in the navigation on the left side. Under ‘Bereitstellen’ you can see the imported expenses. Please select ‘Neu erfasste Liefernatenbelege bereitstellen’. ❕Important: The fields “BU” and “Sachkonto” are hidden in the standardized entry mask. These fields are nevertheless transferred from Circula. If you want to review them, you must change the configurations (Belege online - Konfigurieren der Erfassungsmaske Dok.-Nr. : 1080875). In the next window, select ‘Lieferantenbelege Bereitstellen’. To finish the process, simply select the item in the list you wish to import and click 'Markierte Stapel bereitstellen'. 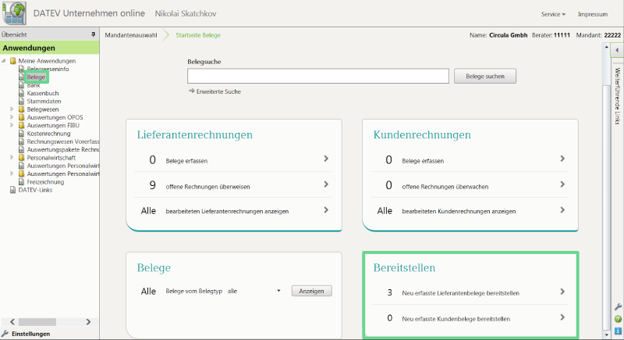 You can now open your individual DATEV software and import the expenses from DATEV Unternehmen Online in your usual flow. 📝 Note: A successful import ultimately depends on your specific DATEV setup. Please contact us if you need individual assistance.